Job postings from around the web. For those who receive my newsletter, this may be some old news. But, who knows, maybe you missed it. I updated the BigLaw 200 Jobs. You can download the updated version for $4.00! You can even share the link with a friend – you’re allowed 3 downloads with each purchase. I hope to get the BigLaw 100 Job List up there soon. If you don’t want to pay $4.00 for the most up-to-date information, you can wait for the BigLaw Job archives. First available? October 2010 – BigLaw 200 Jobs. Some of the jobs on the archived lists will no longer be available because, well, time is of the essence. (Which is why you should buy ‘em when they first come out!) Therefore, I won’t be including any links in the archives either. 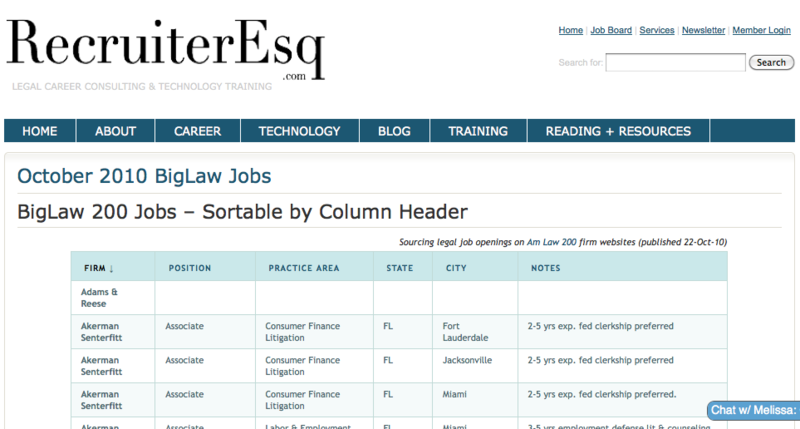 I’ve been going through the state bar associations and compiling links to their job boards to present in one easy reference guide, which is now a link in the Recommended Resources box on the Career page of my site. The Ohio Bar Association Career Center. What do you think? Are state bars helpful in finding employment? What would you recommend for them to do, if you think they need to change? As I was updating the BigLaw 100 job listings, I came across this opening for an Attorney Recruiting Manager at Cooley Godward in NYC. Looks like you can apply through the website. Cooley LLP is seeking an Attorney Recruiting Manager to be based in the firm’s New York office. The Attorney Recruiting Manager will be responsible for managing both the New York and Boston office attorney recruiting programs. Duties include, managing the in-office interview program, the summer associate program and the on campus recruiting program for New York and Boston. The Manager will also maintain a high level of proficiency in the Attorney Recruiting database, including reporting and data entry procedures, to ensure accuracy of office data. 5+ years of legal recruiting experience is required, as is experience with HR/recruiting software. The ideal candidate must have proven supervisory and leadership skills, the ability to work with others and excellent organizational capabilities. A Bachelor’s degree is strongly preferred. Cooley offers a competitive compensation and excellent benefits package. If only I lived in Atlanta! Check out the job description below or head over to the website. At Alston & Bird, a major U.S. law firm with over 800 attorneys, our people trust the people they work for, take pride in what they do, enjoy the people they work with and serve the communities in which they live. Our environment has been praised as one of the most open and receptive in the United States, not only among law firms, but also among all businesses. Alston & Bird has been ranked by FORTUNE magazine as one of the “100 Best Companies to work for” for eleven years in a row. We are proud to be an EEO/AA employer M/F/D/V. The Atlanta office of Alston & Bird is conducting a search for an Editorial Specialist/Proofreader in our Business Development Department. The Business Development Department is looking for a dynamic, detail-oriented editorial specialist/proofreader to work with the business development editor, coordinators and specialty managers on a variety of print and web productions. The editorial specialist/ proofreader is responsible for editing a variety of print and online content, including, but not limited to, client advisories, RFP responses, pitch materials, attorney profiles, newsletters, multi-page brochures, advertisements and event invitations. The editorial specialist/proofreader will work most closely with the business development editor to proofread documents in a fast-paced, results-oriented environment. Speed combined with accuracy is a must; a balance between the two is necessary to excel in the position. A positive attitude and the ability to work well with a variety of personalities are likewise critical. • Work directly with the business development editor to proof documents for spelling, grammatical errors and clarity of meaning. • Ensure that written content in print and on the web is in keeping with the firm’s stylistic guidelines. • Review materials for consistency in format. • Field relevant questions from other members of the department as an expert on the subject matter. • Coordinate with other members of the department to ensure the timely production and publication of projects. • Maintain firm’s reprint files. • Prepare the firm’s Business Development Bulletin Board for all offices. • Maintain and grow the firm’s client permissions records. • Participate, as needed, in marketing pitch preparation. • Bachelor’s degree in English, Communications or related field. • Working knowledge of software on a PC-based platform, specifically MS Office Suite. • Excellent knowledge of grammar and command of the English language. • Ability to function as a productive member in a team-focused environment. • High level of follow-through and accountability to others. • Exceptional organization and time management skills. • The ability to handle multiple tasks with changing priorities. Under general supervision, is responsible for providing coordination support to the law school recruiting function. Guided by department objectives and priorities, coordinates ongoing law school recruiting, including recruiting processes and on boarding. Coordinates various facets of the Summer Associate Program. 1. Consistently promote and model the Firm’s Client Service Principles in teamwork, work product, and personal interaction. 2. Ensure exemplary client service to all internal and external clients; proactively promote client service throughout department and among teams; respond to peer requests with recognition that request serves a client or Firm need. 1. Works under the direction of Law School Recruiter and with other members of the Attorney Recruiting team to implement diversity plans for attorney recruiting that support the Firm’s objectives. 2. Applying detailed knowledge, may review and screen resumes and applications; check references of select applicants; distribute paperwork of qualified applicants to appropriate parties; maintain applicant files. 3. Contributes to the building of strong relationships with prospective hires to ensure substantive, ongoing contact with the Firm, and to promote desired acceptance rates. Under department guidance, provides ongoing applicant communications, guidance, informational and policy assistance, etc. 4. In collaboration with the Law School Recruiter, develops relationships with internal and external clients including attorneys, staff, school Career Services Counselors, outside agencies, other recruiters, etc. 5. Responsible for the coordination of all relevant PeopleSoft notices and other documentation for new hires; proactively ensure that all necessary departments and parties are informed/notified to facilitate new hires arrival and orientation. 6. Substantively participate in firmwide recruiting meetings and committees. 7. Act as ambassador for the Firm in all aspects of attorney recruiting, presenting a consistently professional and positive demeanor. 1. Guided by the Law School Recruiter, department and Firm objectives coordinates and provides support in all aspects of the Summer Associate Program; orientation and training, scheduling, quality and quantity of all summer associate assignments; assists with the coordination of the mid-summer and final performance review process. 2. Participates in the planning for the Summer Associate Program; coordinate meetings, assist in the development of the meeting agendas, may help execute the communication plans, may under general supervision draft communications, etc. 3. Work closely with the Law School Recruiter, Office Hiring Partner and Practice Group Recruiting Partners in the selection of associate summer liaisons; proactively provides recruiting administrative support to liaisons with appropriate information, training, strategic planning support, etc. 4. Work closely with Law School Recruiter, Hiring Partners, Summer Chairs, Summer Associate Hiring Committee and Director of Attorney Recruiting to execute the administrative functions of the Summer Associate offer process. 5. In collaboration with the Law School Recruiter, coordinates Summer Associate Program events, with availability to attend all planned events. 1. Applies developed planning and coordination skills to execute the administrative functions of the Fall On Campus Interviewing Program for the office including: resume routing; assists in the scheduling of call back interviews and gather feedback; assists in the coordination of follow up on offers and helps track the fall cultivation plan; in close collaboration with the Law School Recruiter assists in the tracking of the office recruiting funnel and acceptance rates. 2. Under the general direction of the Law School Recruiter and firmwide management, assists in the coordination of the Fall On Campus Interviewing Program for designated schools including: distribute resumes to appropriate parties upon receipt from schools; draft first version of on campus interviewers; prepare interview packets and schedules for on campus interviewers; organize call back meetings for on campus interviewers and provide the related interview paperwork. 3. Work closely with the Law School Recruiter to encourage attorney participation in the Fall On Campus Interviewing Program. 4. Responsible for providing coordination, planning assistance and in-person support to various receptions and/or dinners at various schools and as part of On Campus Recruiting. 5. Under the guidance of the Law School Recruiter, is responsible for the initial preparation of offer letters; track and compile statistics of interviews, offers made, rejections, offers declined and all other fall recruiting records. 6. In collaboration with the Law School Recruiter, may prepare and participate in OCI Interviewer Training Programs; serve as resource to On Campus Interviewers through established and developed knowledge of recruiting processes. 7. May represent the firm at various law schools at the request of firmwide management. May be asked in assist and/or lead on-campus briefing, debriefing sessions and completion of all summer associate offers. 1. Responsible for the upkeep and accuracy of all applicant records in PeopleSoft. Responsible for data entry and processing of response letters. 2. Assists in tracking and compiling statistics of attorney new hire data; generate reports upon request; track law school recruiting expenses and may assist in the preparation of the annual recruiting budget. 3. In collaboration with the Law School Recruiter, assists in the tracking of the Summer Associate Program, OCI Season and general recruiting budget; track costs; maintain appropriate cost controls to ensure budget is met and budget is appropriately allocated. 4. Responsible for the coordination and daily management of Time Trade at the local office level. 1. Remain current in industry trends in attorney recruiting and the legal profession. 2. Ensure expertise in relevant technology; proactively use most current technology to further teamwork, client service, and efficiency. 3. Ensure client service and performance consistently meet Career and Compensation Management Program (“CCMP”) expectations for Matrix Level 4. 4. Regularly review position against Matrix expectations and develop goals to further increase position value. Safeguard and keep confidential any information, observations, or viewpoints regarding Firm and client business matters. Adhere to the Firm’s General Safety Practices and any unique safety practices for department and building. 1. Bachelor’s degree plus 1-2 years of recruiting experience or equivalent combination of relevant education and experience. 1. High client service ethic and a proven record in delivering exemplary client satisfaction to external and internal client constituencies. 2. Excellent writing skills; ability to present complex ideas succinctly and clearly. 3. Strong interactive skills and the ability to succeed in a teamwork environment. 4. Strong sense of accountability, taking ownership over projects and responsibilities and resolving issues proactively. 5. Ability to prepare accurate, highly detailed work product. 6. Ability to assess information, anticipate issues and outcomes, and make effective decisions. 7. Ability to organize time, prioritize workload effectively, and work independently. 8. High comfort level with sometimes stressful client requirements. 9. Skill to assess issues and needs and to provide responsive solutions. Latham & Watkins is one of the top ten law firms in the world, with more than 4,000 personnel located in 30 offices around the globe. Since 1934, the attorneys, paralegals, and professional staff of our firm have been driven by the core values that define who we are: respect, entrepreneurship, teamwork and a commitment to deliver the highest quality work and service to our clients. Regardless of title, everyone at Latham is expected to exceed expectations, reach for new challenges, and achieve great things. In addition to providing legal counsel to top public and privately held corporations, investment banks and private equity firms, Latham provided more than US $100 million in free legal services in 2009 alone via its award-winning pro bono program. A leader in professional services, Latham employs the best and brightest professionals to sustain the firm’s growing global infrastructure and support the operations of each of our practice offices. We are currently seeking a Manager of Attorney Recruitment and Development to join our San Diego office. As a Manager of Attorney Recruitment and Development at Latham you will contribute your expertise to contribute to the strategic planning and implementation of goals and objectives of the Department. You will report directly to the Office Administrator. The successful candidate will manage all aspects of lateral attorney hiring, the fall and summer recruiting programs, and new attorney orientation, integration and development. Your responsibilities will include developing and maintaining relationships with Office Managing Partners, Local Department Chairs, Global Recruiting Managers and other local Recruiting Committee members regarding the ongoing hiring needs of practice offices. You will also ensure that a full array of training and professional development opportunities are provided and will develop budgets and monitor expenses for outreach and recruiting efforts. Leadership ability, supervisory experience, professional presence, initiative, team orientation, commitment to diversity and excellent interpersonal, organizational, management, and technical skills are a must. Latham & Watkins values versatility and adaptability in our high paced, collaborative environment. You will be expected to apply your organizational skills, communication skills and attention to detail to meet multiple deadlines while displaying a positive, high-energy attitude. You must have a bachelorâ€™s degree in business or a related field â€“ an MBA or JD is a plus. An ideal candidate should have five (5) years of experience in a large law firm or professional services environment. This is a great opportunity for a candidate who has strong management skills, ability to establish and manage deadlines, excellent leadership skills and well developed interpersonal skills. If you are the right candidate and can meet these requirements, please submit your resume by clicking the Apply Now link on this page. Latham & Watkins is an Equal Opportunity Employer. Our commitment to diversity, equal opportunity and sustainability enables Latham & Watkins to draw from a remarkable wealth of talent to create one of the world’s leading law firms.